Twenty years ago Natalie, a close friend growing up, got married one month after college graduation. At the bridal shower, her mom said, “One day soon, Laurel, we’ll be throwing one of these for you!” It feels like this happened only yesterday, and it could have. I spent my twenties working, partying, and sowing wild oats, my thirties were about achievement, self-actualization and coming into my own. Friends got engaged or married along the way, but I always maintained a fairly large circle of single friends. We had each other and nothing about our lives seemed out of the ordinary. But I am settled. I own my house, a car, two cats. I have an amazing job with a 401(k) plan. I play volleyball, hike, run, bike, ski and do yoga. I speak three languages. I’m not in prison, but I feel as settled down as I possibly could be. I was living in Mill Valley, Marin County, and had lunch with Maggie and Jill, friends I’d made while trekking through Machu Picchu. I had been looking forward to catching up for weeks. Maggie had recently gotten married and Jill was about to, even though she had been on and off again with her boyfriend for years. He would lock her out of their house, and yell things like “I’ve never loved you,” and “You’re not the type of woman I’d marry.” She admitted that she had slept in her car outside the house on more than one occasion. Yet here she was, gleefully laying out the details of their wedding to come. Nothing else mattered. I listened with intent, nodding my head in approval with a smile, when appropriate. Maggie brought her wedding photo proofs, and was trying to figure out which ones to have printed. She and Jill obsessed over each picture, the cake, the family, the kids, trying to pick the perfect keepsakes, when I realized I wasn’t a part of the conversation. I was smiling, bobbling my head when a dark wave of sadness overcame me. I felt invisible and wondered if they’d only invited me out of obligation? I moved to New York City, the one place in the world where I felt I could blend in with my chronic singleism. I got a job at MTV and made fast friends with my twenty and thirty-something counterparts. I felt like I belonged, I felt normal again. I had single pride. Thanks to Facebook, I reconnected with my friend Jeanne from college. She lived in a tiny suburb outside Boston and was married with three kids. “Come out for the weekend,” she begged me. “Just because we’re married with kids, doesn’t mean we don’t know how to have fun, you know!” She was intent on getting me out there. After months, I finally caved and went out for a Saturday night in the burbs. I took the train to Boston, and Jeanne picked me up in her minivan. She made dinner reservations at their favorite Thai restaurant in town, “they know us well,” she assured me. She took me to their mcmansion and I quickly changed. We then drove down the block picking up two more couples at their mcmansions and the seven of us traveled to dinner in the best minivan ever. “See we know to have fun!,” said Jeanne’s husband Peter through his purple lips as he lifted his wine glass for a toast. After dinner, we went back to their neighbors Jerry and Vanessa’s mcmansion for a night cap. “Hey maybe I can get Laurel to take her clothes off and go hot tubbing with me,” Jerry said as he put his arms around my waist. Vanessa announced she was going outside for a smoke. “I’ll join you,” I said, unleashing myself to run outside. “How old are you?,” she asked. Really? After a whole night of me talking about all the men in my life. When I first moved to New York, I visited my friends Lisa and Matt, then married nine years and with two kids, at their home in New Jersey. I didn’t know many people yet in New York, and was looking forward to a relaxing weekend with good friends. “You just can’t do what you want, when you want,” Matt added while washing the kids’ cereal bowls. “You don’t know how easy you have it,” Matt said. Lisa called me two weeks ago. Turns out Matt had been having an affair with his female boss. A byproduct of that affair was Matt and Lisa’s newly acquired debt. Matt had been spending beyond his means on his romantic escapades. I love my life. I’ve had amazing experiences. I’ve loved my jobs. I’ve lived in the some of the best cities in the world – Los Angeles, San Francisco, Paris, New York. Yes I have baggage, and I’ve used it to travel throughout Asia, Africa, Europe and South America. Natalie reconnected with me after our twenty year high school reunion. We lost touch fourteen years ago. I had dinner with her family last Christmas and was berated with questions about my life in New York, and I happily answered them. Nat had gone through a depression at thirty years old. She had the marriage, the kids, the higher degree, but had lost her identity. She wanted to come visit me in New York. She had never been. Don’t get me wrong, I have married friends whose relationships I adore. Erika and Richard have been married for twelve years, I love them both dearly. We go to sushi whenever I’m out in Los Angeles. We catch up, swapping stories about life, work, travel. I don’t feel like a circus freak with them. They don’t criticize my status or tell me what I need to be doing differently to get hitched. The love me for me, singleism and all. Would I like to get married someday? Yeah, maybe, but the older I get, the more I see the wandering eyes, the cheating, the cover ups, the forced facade of happiness behind the scenes of this “Till death do us part” theatre production. It’s not about the wedding announcement, the ring, the photos or the cake you served. It’s about happiness. 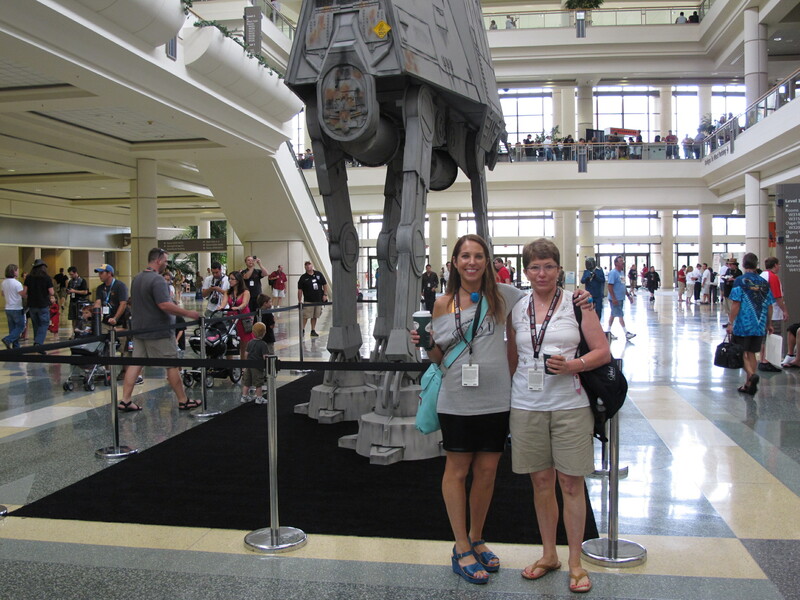 I’m forty-one years old, single and taking my mom to the Star Wars Convention. It’s not a wedding photo, but it makes a great snapshot. This entry was posted in The Real Dirt and tagged MTV Geek, Prison, Star Wars Celebration by laurel. Bookmark the permalink. Laurel – you have a gift! Best blog yet, frankly. Great post, Laurel. Looking forward to the book (full disclosure: I’m married and own a minivan). Btw, meet any interesting single guys at the Star Wars convention (ha! I couldn’t resist). Lova ya. Brilliant. I am right there with you (and I am married w/twin boys). I can’t imagine being around people like that – “…like they now have a special flying status that always gives them first class seating, while I’m stuck in coach.” Gag me with a spoon. I live with the choices I’ve made, despite being rather ambivalent along the way. You are true to yourself and to that, I raise a glass – or two. You da bomb, L.
Hell yeah! I love your writing and I wish I could have done what you did. The flip side of all that marriage business is my miserably bloggy rantings about divorce. Nobody ever really gossips about divorce like they do about weddings and they actually cost about the same. Oh, Woodsy, so eloquent and funny! I sail on the Happily Single boat with you, and have also had the pleasure of getting those same comments. My favorite, whenever anyone is completely aghast over my past-40 singleness or my intentional childlessness: “Oh, you’ll change your mind.” How offensive. I really won’t. I just got back from fricking South America, and I’m going out every night this week, bizatches! No tears in my beer, thanksverymuch. Oh Laurel, don’t make me pee my pants this early in the morning. Damn you! What a gift you have, truly funny, touching and “dead on”. Did you submit this to the Times? Great post Laurel. Not sure quite what to say but I enjoyed it. I’m looking forward to our next visit to MBC. This fellow NYC-er feels ya, sister. One of my friends is entering the lobotomy that is planning the wedding….it makes me wanna take a NAP.